Carter Burden Gallery presents three new exhibitions: Painted Verse in the East Gallery featuring Steve Silver andBarbara Coleman; Continuation of Color and Abstraction in the West Gallery featuring Emily Rich; and On the Wall featuring Azita Ghafouri. The reception will be held August 23, 2018 from 6 - 8 p.m. The exhibition runs from August 23rd through September 13th at 548 West 28th Street in New York City. There will be a poetry reading by Steve Silver on Thursday, September 6th from 6:30 – 7:30 p.m. The gallery hours are Tuesday - Friday, 11 a.m. - 5 p.m., Saturday 11 a.m. - 6 p.m. In the exhibition Painted Verse Barbara Coleman presents large abstracted paintings that harness contrasting elements into harmonious visual experiences that are at once lyrical and joyful, yet full of depth and complexity. The pieces featured in the exhibition are part of her series entitled Queen of the Night, that depict ghostly figures juxtaposed with abstract organic curves and calligraphic forms as illuminating counterpoints to the geometric and angular shapes. These gestural forms are at times slow and expressive and in other instances pure bold bravado. Coleman’s palette is both vibrant and nuanced. 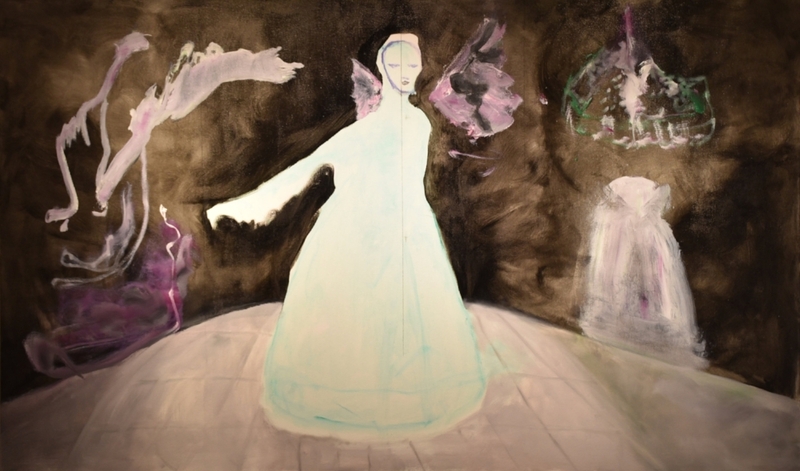 She uses both color and brushwork to impart sensations of fluctuating opacity and translucency. Her use of shape and tone communicate a sense of depth and movement. All of these elements converge in a perfect balance for an elaborate visual journey. In his first exhibition with Carter Burden Gallery, Steve Silver presents works from various series using interference acrylic paint to create iridescent and brilliant wall mounted geometric sculptures that protrude off the wall. His works featured in Painted Verse are lustrous and complex in both color and texture. Influenced by Georges Braque, a founder of the Cubism art movement, and Googie architecture, Steve Silver’s particular use of compartmentalization and space age aesthetics developed into a distinctive body of work. Silver states, “The satisfactions of painting are so great it seems like it must be some kind of illegal activity." Continuation of Color and Abstractionfeatures work in a variety of media, including oils, acrylics, watercolor, and collage. Emily Rich uses the language of abstraction in her paintings to explore the changing environment, from the destruction of the shorelines and beaches to the kinetic energy of a city that never sleeps. Rich adroitly integrates a palette of bold and subtle colors, applied as if engaging in an artist tango that is both passionate and deliberate. The pieces are both painterly and sculptural, with applied, folded, and painted fabrics on the canvas surface. The resulting work engages the viewer in a visual dance replete with movement and energy. In On the Wall, Azita Ghafouri presents a large installation of bold and vibrant painted canvases that have been torn and reapplied to one another, creating an undulating visual effect. With a background in architecture, Ghafouri’s work has a structural quality, while her abstract paintings highlight her energetic brushstrokes.